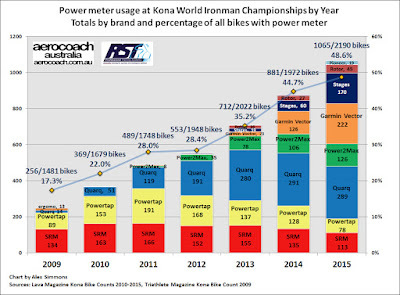 In brief, 2015 continued the long term trend of an increase in use of power meters by Kona IM athletes, with a tick under half of all bikes now fitted with a power meter. 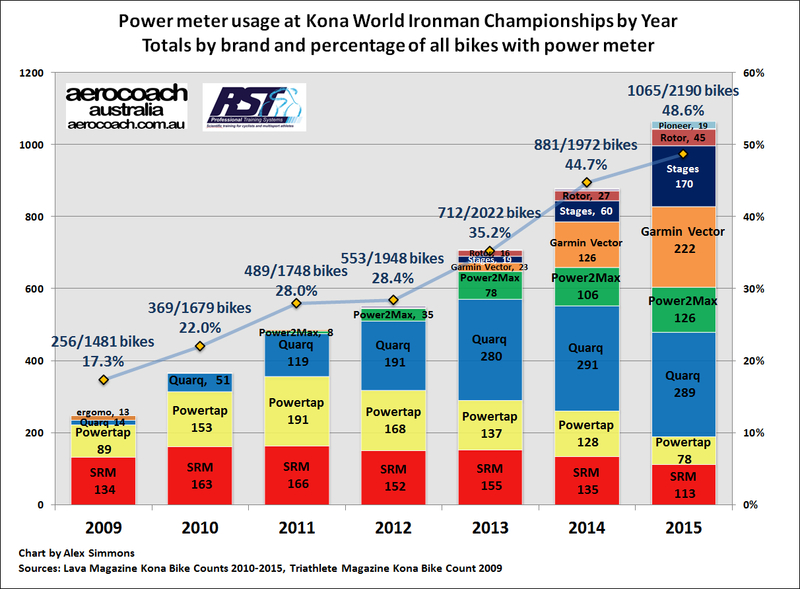 The two longest established brands, SRM and Powertap, have further fallen away in absolute numbers as well as total share dropping with Powertap suffering the biggest drop in usage, and while Quarq is still the most used meter, its absolute usage has reached a plateau and it is no longer as dominant a power meter brand for Kona IM athletes as it has been in the past few years. It will be interesting to see how Powertap fares in the years ahead with the introduction of their new pedal and chainring based meters. 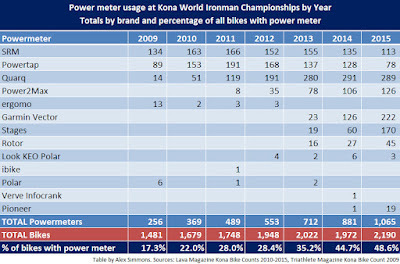 The use of power meters is more evenly distributed across the various brands than in previous years, with no brand dominating share of usage on Kona IM athlete's bikes. Newer power meter brands have increased their presence significantly, in particular Garmin Vector and especially Stages being the big movers. 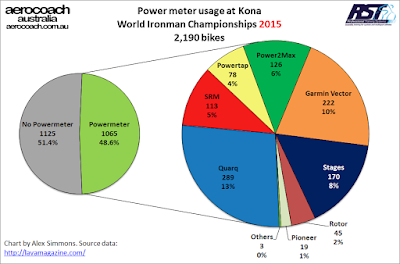 Power2Max maintained their 2014 share of the power meter pie, while newer offerings from Rotor and Pioneer make up the smaller slices. Thanks to Prof. Hendrik Speck of Hochschule Kaiserslautern University of Applied Sciences for picking up a couple of very small errors in the Polar power meter numbers I had listed for 2009 and 2013. I have updated the table and chart above. I also left the linked posts from previous year's summaries uncorrected so that a record of the small error remains. All those, plus perhaps ignorance of how to use power meters and their data effectively, and a realisation that a PM is not absolutely essential to attain many goals. However when you look at the trend line for usage, next year will be the first time PM usage will be on the majority of race bikes. 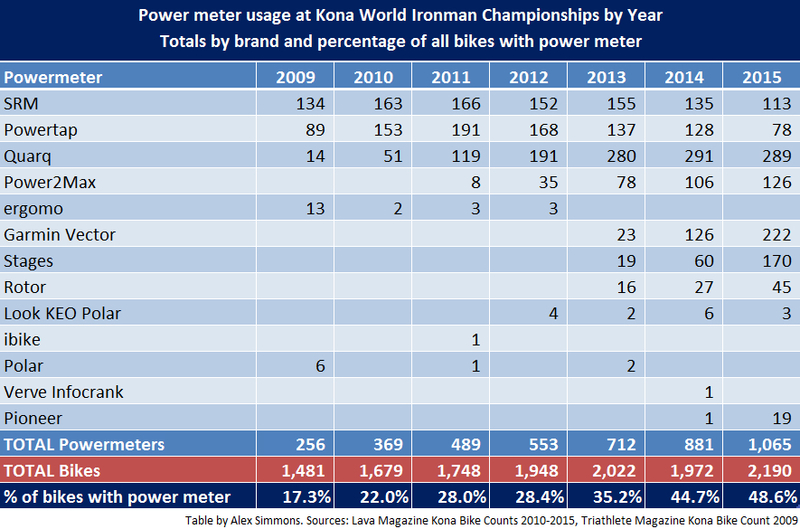 I'm still surprised that only half the bikes in Kona had a powermeter..